I am new to the forum site here. 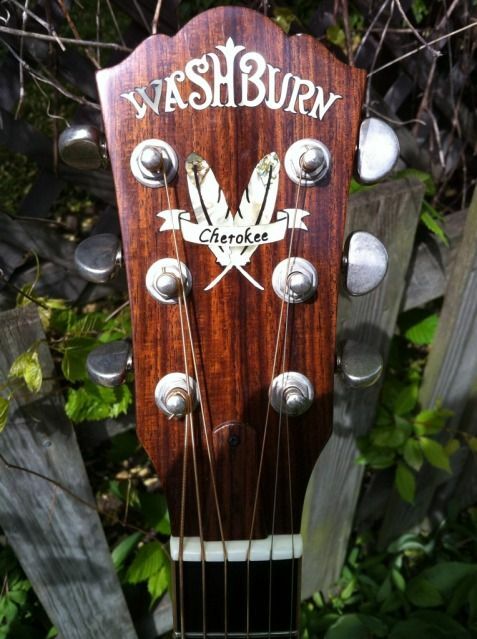 I have a Washburn acoustic, D56SWCE. I started playing the guitar with an old cheap one about 42 years ago. I dont even remember what it was but I do remember that I had to have pretty tough fingers to fret it...lol. I started playing country music and a little bit of the old rock and roll, put together a country band, had a blast with it too. Now that I have become all grown up I have advance to bluegrass and enjoy the flat pickin and speed that it offers. When my yougest son was 7, I started him on the fiddle. He is now 28 and a few years ago he migrated to the mandolin. He is the real picker in the family. His instrument has 8 strings and mine only has 6...lol. But anyway, I have been enjoying reading the forums on here and it looks like I can learn a lot from you guys. Welcome. Good story, and well done getting your son to love music. looks like I can learn a lot from you guys. Welcome to the forum John! Humble, eh....you're not too far from some fairly good acoustic music venues here in Houston. How long have you lived in the Houston area? DTOM and I both live within tobacco spittin' distance of Houston....and we also occasionally join the Shiners and Pappy at Pearl, TX for a monthly bluegrass festival. If you're interested in joining us, you'd most certainly be welcome (and, most likely, also be able to outplay most of us if you're into the flatpickin' sort of bluegrass)! Welcome to the forum! It is a small world! I know exactly where Humble is - didn't know you fellas were from around Houston, though. I was born in Austin and lived in Houston from 1972 thru 1988. My dad, mom, and brother live in NW Houston - Cypress area. Heh-heh... I knew y'all talked with a drawl, but I didn't know y'all typed with one too. With so many so close, we should get a pickin together. I go over to Montgomery on the 1st Saturday of each month regularly and play but not sure where Pearl is. I have lived in and out of Texas all my life. Work has taken me out of the state on a couple of occassions but I always find my way back. Mamaber....lol every once in a while I type like I pick..sometimes I hit the R string. With so many so close, we should get a pickin together. I go over to Montgomery on the 1st Saturday of each month regularly and play but not sure where Pearl is. Don't let the Pearl Bluegrass website fool you, this is WAAAY more than a Saturday afternoon event. The pickin' 'n' grinnin' usually starts somewhere around Thursday evening, when the RV's start rolling in (I camp out in a tent, quite comfortably). The building is opened up on Friday (there are restrooms with showers) and the jam rooms can be full or empty, depending on who's there, during the day, but they are all full on Friday evening. Saturday the local long-timers show up in the morning and the 4 jam rooms are all busy pretty much all day, as is the stage starting around 1 PM. After the stage acts are over (usually around 6 or 7 PM, depending on how many there are) everyone takes a break for dinner, then we all find our way back to the jam rooms and the jams usually break up somewhere between 10 PM and midnight. Anyone who arrives AND leaves on Saturday afternoon and thinks they have experienced Pearl is in for a HUGE surprise once they find the time to stay for the after-dinner jams. The jams are not limited to the 4 classroom/jam rooms, there's a large covered area outside where some of the best play (it seems to be the preferred location for the tobacco addicts, as there is no smoking allowed inside the shcool house). Impromptu little jam groups spring up everywere outside if the weather is good (you'll see our little Texas Washies group in that Washburn thread), and if you make it a habit to go you'll get to know the regulars pretty quickly. They are not cliquish at all....every one of them is gracious and readily welcomes strangers to the circle. How about telling us more about the monthly event at Montgomery? There are monthly events at Dickinson and League City (both near to Houston) and Belleville has an annual festival in September (I think), maybe October....plus they have monthly events for SOME of the months, not sure which ones, but certainly not the winter months. The Mucky Duck has a great kitchen and a fair selection of beers on tap.....and they have a GREAT lineup of entertainers (almost all with cover charges) during the week....open mic is Monday night. JP's is a bit less formal than the Mucky Duck....no kitchen, but an incredible range of brews, both imported and domestic. Their open-mic night is Sunday. I feel a bit more comfortable playing there, the atmosphere is more like Cheers with a large group of regulars who inhabit the same table every night (well, every night I've been there, anyway) and every Wednesday they do a cool Hard Times Soup Kitchen in which a few of the regulars bring a crock-pot of soup and anyone who wanders in can eat for free and listen to the Hard Times Troubadors quartet and a separate Guest Troubador without any cover charge....AND, most of their stage acts don't have a cover charge, either. The only one I can recall having a cover charge was Shake Russell....and well worth it. Both venues emphasize acoustic music, have PA systems into which you can plug you D56SWCE, and can mic an acoustic-only instrument, too. Mucky Duck is downtown Houston (very near Kirby Dr. and U.S. 59) and J.P.'s is west Houston (very near Westheimer and TX Hwy 6). If you decide to give Pearl a try, I'll see what I can do about rounding up the usual partners in crime....Pappy, the Shiners, DTOM, along with whatever others they will bring. We haven't heard from Strumsalot for a LOOOONG time on the forum, but I might be able to get an email through to him through the forum, we'll see. Casting calls usually show up on the Texas Washies thread if one of us is planning on going up there. Bring your guitar with the R string......just don't bring an electric guitar, as Pearl is no amplifiers allowed territory. The 1st Saturday in Montgomery is held on the 1st Sayurday of the month....imagine that. There are usually 2 or 3 groups spread out around the old town area and I usually walk from one to the other throughout the morning. It starts up around 10am and goes untill everyone gets tired and leaves. I wouldnt say that it is a formal picking, just anyone that shows up and wants to play and sing. Pearl is a pretty good clip from me but when the weather cools off a little bit, I may try and make it over there for the weekend, sounds like fun. ....lol every once in a while I type like I pick..sometimes I hit the R string. Welcome aboard John. May I know where is the R string? Well the R string is evry string that I hit rather than the one that I was intending to hit. I have a lot of R strings on my guitar. Wow! That must be a lot. Tio and Shiner? ...I shoulda' known you two would frequent this board! Hey Tig! Is that a WI66 in your signature!! Not too much happening as of late, feel free to liven things up a bit. Yep, but a bit premature... It ships tomorrow so I should have it this week.